As the name implies, sunset hyssop plants produce trumpet-shaped blooms that share the colors of the sunset – bronze, salmon, orange and yellow, with hints of purple and deep pink. Native to Mexico, Arizona and New Mexico, sunset hyssop (Agastache rupestris) is a hardy, striking plant that attracts butterflies, bees and hummingbirds to the garden. 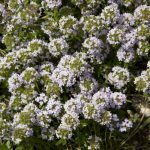 Growing sunset hyssop isn’t difficult, as the plant is drought-tolerant and requires little maintenance. If this brief description has piqued your interest, read on to learn how to grow sunset hyssop in your own garden. Sunset hyssop is a hardy, versatile, fast-growing plant suitable for growing in USDA plant hardiness zones 5 through 10. At maturity, clumps of sunset hyssop reach heights of 12 to 35 inches, with a similar spread. Plant sunset hyssop in well-drained soil. Hyssop is a desert plant that is likely to develop root rot, powdery mildew or other moisture-related diseases in wet conditions. Water sunset hyssop regularly the first growing season, or until the plant is well established. Thereafter, sunset hyssop is very drought tolerant and generally does fine with natural rainfall. Mulch sunset hyssop lightly with pea gravel in late autumn if you live in the cooler range of hyssop’s acceptable growing zones. Avoid compost or organic mulch, which may keep the soil too moist. Deadhead flowers as soon as they wilt to encourage development of more buds. Deadheading also keeps the plant neat and attractive. Divide sunset hyssop plants in late spring or summer if the plants look overgrown or are outgrowing their boundaries. Replant the divisions, or share them with friends or family. Cut sunset hyssop nearly to the ground in early spring. The plant will soon rebound with a burst of healthy, vigorous growth. 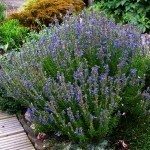 Read more articles about Hyssop.